Iodine Global Network (IGN) - How is salt made? The physical characteristics and chemical composition of salt vary widely, depending upon the composition of the raw material and the manufacturing process. Briefly, salt for iodization should be at least 98% NaCl by weight, and less than 0.2% calcium, 0.1% magnesium, 0.5% sulphate, 0.5% insolubles, and 3% moisture. In the less developed countries where IDD is more prevalent, the salt commonly consumed is usually the coarse crystalline variety. 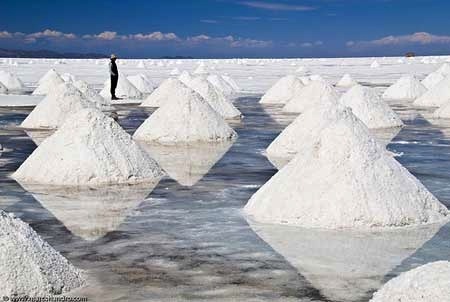 In many developing countries, salt after extraction from the sea, lake or underground deposits will typically consist of crude lumps or granules which contain, in addition to sodium chloride, sand, mud, other salts and organic matter. This crude salt is generally off-white or yellowish-brown in colour. This crude salt is often used directly for some industrial purposes, for livestock use and in some countries even for human use. (a) food grade salt is the crystalline product consisting predominantly of sodium chloride. It is obtained from the sea, from underground rock salt deposits or from natural brine. This standard applies to salt used as an ingredient of food, both for direct sale to the consumer and for food manufacture. It applies also to salt used as a carrier of food additives and/or nutrients. (b) shall have a content of NaCl not less than 97% on a dry matter basis exclusive of additives. Crystal modifiers 10 mg/kg singly or in combination of Na, K or Ca ferrocyanides, expressed as [Fe(CN)6]*For Na and K ferrocyanides, max. level may be 20 mg/kg when used in the preparation of "dendritic" salt. the name of the food shall be "salt". the name "salt" shall be qualified by a declaration of either "Food Grade" or "Cooking" or "Table"in close priximity to the name. when salt contains one or more ferrocyanide salt added to the brine during the crystallization step, may the term "dendritic" be included in coinjunction with the name. an indication of either the origin or the method of productioj may be declared on the label. where salt is used as a carrier for one or more nutrients, and sold as such for public health reasons, the name of the product shall be qualified to indicate such purpose, e.g. "salt fluoridated", "salt fortified with iron". when salt is used as a carrier for nutrients and sold as such for public health reasons, date marking is needed whenever the shelf life of the product is valid to the end of a given time. Recrystallization is the standard method for producing salt for table, dairy and industrial purposes, the table salt being a screened size extracted from general production and treated with free flowing agents. Crude salt is dissolved in fresh water to make saturated brine, which is then treated with chemicals to precipitate calcium and magnesium impurities. The clear, treated saturated brine containing 305-310 g/L NaCl is fed into a triple effect vacuum evaporator system consisting of an evaporator, a tube bundle heat exchanger and a circulation pump. First, the brine is heated, to force evaporation in the upper part of the crystallizers, exceeding the saturation point in the brine and resulting in crystal formation. To control the heat during crystal formation more precisely, the brine contained in each crystallization stage is circulated by a pump. Brine is heated in the exterior heat exchanger. The first crystallization is heated by live steam, while the second and third crystallizations are heated by vapors from the previous stage. The live steam condensate from the heater of the first stage returns to the boiler house. The salt slurry produced in the crystallizers is pumped from the evaporator legs to a settler tank. There the excess mother liquor is returned to the system. The thickened suspension is filtered and dried in a top feed filter to a moisture content of 0.15% or less. The dry salt is iodized and sprayed with anti- caking agent/free flowing agent. The product salt is passed through an oversize screen to remove any agglomerates, and then conveyed to silos for packing in bulk 50 kg High Density Poly Ethylene (HDPE) or Poly Propylene (PP) bags or retail 1 kg Low Density Poly Ethylene (LDPE) packs. A variation of this process is the 'International Process,' in which the crude salt is dissolved in a brine circuit by live steam in a direct contact heater and the hot slurry flash-cooled in an evaporator. On cooling, the solubility decreases and crystallization results. This method of crystallization eliminates the need for tubular heaters. The process can be adapted to multiple-effect evaporation and can also be designed to use thermo-recompression. It is more economical than the conventional vacuum crystallization process in both capital and operating cost. Hydromilling is essentially a physical upgrading process in which the salt is ground and washed several times in saturated brine. The product is comparable in most respects to recrystallized salt and indistinguishable from it by the consumer. In this process, raw salt is fed into a hopper and delivered at a uniform rate through a roller feeder and bucket elevator to a hydromill, into which brine is also introduced. The hydromill grinds the salt and discharges it as a slurry into a receiving tank, to which fresh brine is then introduced. Gypsum and fine insolubles are separated by flotation with froth formed in the hydromill. The salt slurry is then passed through a slurry pump to a thickener, where it is further concentrated before being fed into a continuous centrifuge. The salt undergoes a fresh water wash and then is concentrated in a centrifuge until its moisture content is about 3%. Next, the centrifuged salt passes through a fluid bed drier, is dried to a moisture content of less than 0.15%, and then cooled. It then passes through a blender with screw conveyor for mixing with any additives. Finally, the salt is stored in silos and packed. For further information on how solar salt is made, the 1982 Guidelines by the United Nations Industrial Development Organization are still appropriate and useful.